Windjammer Landing on the island of St. Lucia, previously a winner of FTF’s Top 10 Getaways for Tiny Travelers award, gets a fresh look in 2015. 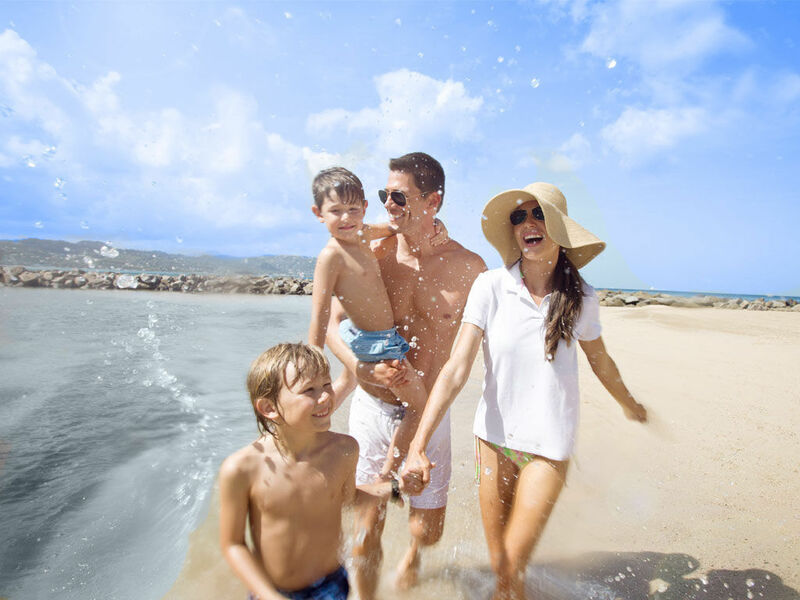 Known for its beauty and tranquility, St. Lucia is a great destination for families seeking an unspoiled, tropical environment and natural attractions such as a rainforest, mineral baths, and pristine beaches. Located on the beach near the capital city of Castries, Windjammer Landing’s white stucco, red tile-roofed, Mediterranean-style suites and villas are clustered into “villages” along the wooded hillside. This resort offers comfort, relaxation, a wide variety of watersports, and private infant care to enable parents and older children to snorkel or hike the Piton Mountains. Windjammer is a classy but casual place: facilities include five restaurants, five pool (including one for kids), tennis club, the Serenity Spa, a fitness center, and nearby golf course.Go to the water sports center for wind surfing, snorkeling, Hobie Cat sailing, waterskiing and scuba diving (with lessons for first-timers and kids), as well as for accomplished divers. The Jacquot Fun Club, so-called after the Creole name for the St. Lucia parrot, offers a complimentary, fully-supervised program daily from 10am-4pm and 6:30-10pm for children age 4-12 years. Typical activities including beach and water sports, nature walks and T-shirt designing are enhanced by cultural experiences such as limbo Creole/Patois lessons and visits to the local markets. The Teens Club (13-18 years) features organized land and water activities, a game room, escorted shipping tirps and tours. Fun evenings are spent around bonfires, doing karaoke, or watching a movie. Don’t worry, tiny travelers are not forgotten here! For parents whose tots are too young for the Jacquot Fun Club, Windjammer Landing’s nanny service is a real blessing. A trained nanny, experienced in infant care and CPR, will care for your baby or toddler in your villa, play with her in the Jacquot Club or accompany her to the beach or pool at the rate of $10/HR. Additional evening babysitting is also available.